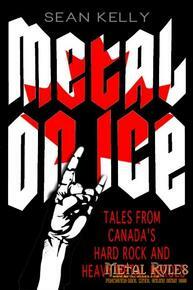 In Metal On Ice: Tales from Canada's Hard Rock and Heavy Metal Heroes (Dundurn Press), musician Sean Kelly (Crash Kelly) interviews Helix, Anvil, Coney Hatch, Killer Dwarfs, Harem Scarem, Honeymoon Suite, and a host of VJS and industry insiders about the exciting rise, then lull, of the Canadian metal scene into the 1990s, and its resurgence in recent years. "The road to Canadian musical glory is not lined with the palm trees and top-down convertibles of the Sunset Strip. It is a road slick with black ice, obscured by blizzards, and littered with moose and deer that could cause peril for a cube van thundering down a Canadian highway." Julie Wilson: Why do you think metal and hard rock resonate so particularly with young fans who become fans for life? Sean Kelly: They can provide a sense of power and belonging to those who don’t necessarily feel very empowered or included in other areas of their lives, especially young people. Many fans I've spoken with have mentioned that it was through this genre of music that they experienced their first real moments of social bonding outside of their immediate families. There's also an escapist quality to the music that appeals. While they weren’t Canadian, the band Saxon said it best: "Denim and Leather brought us ALL together!" JW: In Metal on Ice, you open with a scene at your local hockey rink and describe the music you could always count on to come over the speakers. It amuses me how many hard rock/metal songs I know by heart because of roller rinks, road trips, and movie soundtracks. What would your list of a few Canadian songs that readers would think, "Of course, I know that!" include? SK: I’m finding it hard to separate the Canadiana from these titles; hell, even the most American-sounding is by a band called Toronto! JW: In Canada, has anything ever replaced "The Power Hour" on MuchMusic (1986–1991)? Talk a bit about the influence that show had on burgeoning Canadian acts. SK: "The Power Hour" was the young head-banger’s mainline to the most current American and European metal content. More important, it showed that Canadian bands could stand toe-to-toe with bands with twice the recording budgets and 10 times the hype. I don’t think anything could come close to recapturing what "The Power Hour" was to Canadian metalheads. For that one hour, every Thursday, you could turn off the outside world and get lost in a show devoted entirely to YOUR type of music. I’m sure many of the artists in Metal on Ice took cues from what was happening with American bands that got to play on the show, because many of them also had a goal of "breaking" America. JW: Why did you want to write this book, and a proudly Canadian one? Was it to fill a gap in musical history? SK: It's always bothered me that when I pick up Canadian music books there's never more than a cursory (and usually pejorative) mention of heavy metal and hard rock, if the genre is mentioned at all. This is music that brought a lot of joy to a lot of people, and many of these bands were pioneers in bringing Canadian music outside of our borders in a meaningful commercial way. I wanted to highlight that many of these artists are still out there making new music and touring. I also wondered if the hopes, dreams, and struggles I’d encountered as a musician trying to forge a professional career were similar to those of the Canadian artists I learned from. Finally, I wanted to explore if there was indeed something distinctly "Canadian" about the Metal on Ice artists, to see if the characteristic traits of Canadians, be they perceived by those abroad or by us at home domestically, actually applied. SK: The music that first grabs us in our early years stays with us in a deep way. It's the soundtrack to our formative experiences, and a link to our innocence. However, I find that with heavy metal, there's a sense of community that's hard to let go of as we move into our adult years, and true fans don’t really seem to outgrow it. Or, maybe they just don’t ever grow up! JW: How did you go about selecting who would appear in Metal on Ice? SK: I simply went with the bands and artists that spoke to me as a young fan. I also tried to include other bands (particularly the thrash bands) that I didn’t necessarily have a huge affinity for. I wanted to see if the career paths and obstacles the more underground artists faced were the same as the more mainstream acts I loved. A wonderful byproduct of including these bands was that I have a much deeper appreciation of their music, and I discovered a bunch of great new albums! JW: How do you feel about present day metal/hard rock in Canada? Is it still about hitting the road and building an audience at shows? Or has online media changed how bands go about finding fans and the quality of their music? SK: For the more established bands, it's about finding their existing fan base through social media, and letting them know they're still out there touring and, in some cases, putting out new music. For young bands, social media is crucial to a successful promotional campaign—this is how fans consume music. However, the visceral and communal nature of metal is such that it's incumbent upon bands to bring their live show to the people. The feeling of a packed, sweaty, loud rock bar with the walls glistening with humidity is not something that can be transferred via digital files. It's in the live environment that true fans are made. It's great to see young bands like Diamonds, Skull Fist, and Axxion adhering to these principles, and they're even making their records available on vinyl. How cool is that? JW: Tell us about the PledgeMusic campaign. SK: As an accompaniment to the book, a soundtrack with some of the Metal on Ice artists seemed like a no-brainer. We wanted to make the book louder! Lee Aaron, Darby Mills (Headpins), Brian Vollmer (Helix), Carl Dixon (Coney Hatch), Nick Walsh (Slik Toxik), and Russ Dwarf (Killer Dwarfs) are all involved in recording an EP of some of their biggest hits. In Nick’s case, we're doing a new version of Kick Axe’s "On The Road To Rock" with Victor Langen on bass. The PledgeMusic campaign is helping us raise the funds to make the record. Fans can pre-order the album, signed items (copies of the book, Kramer guitars, Sennheiser microphones, album artwork, etc. ), as well as an In Studio experience where they can sit in on Q & A with the artists, hosted by former Power Hour host Christopher Ward, listen to tracks in the studio, and then watch the artists record vocals for the album, and even participate in recording some vocals! They can also pick up their VIP passes for the Metal on Ice concert happening October 26th, 2013, at the Phoenix Concert Theatre in Toronto. Fans interested in supporting this part of Canadian music history can go to www.pledgemusic.com/projects/metalonice. SK: Ha! My first album was Quiet Riot’s Metal Health. My first music purchase was the "Jump (For My Love)" '45 by The Pointer Sisters! My grandmother took me to the Northgate Square Mall in North Bay for the express purpose of buying it! JW: What was the first metal/hard rock album, song, and/or artist(s) that first rocked your world? SK: Twisted Sister, Motley Crue, Def Leppard, and Helix. When I first heard "We’re Not Gonna Take It" by Twisted Sister, I really couldn’t imagine doing anything else for a living other than being a musician. The same can be said of Helix’s "Rock You." JW: What's the unlikeliest album you bought and loved that isn't metal? SK: Daniel Lanois’ Acadie. "The Maker" is the song I want played at my funeral; not any time soon, mind you! JW: Will metal attitude ever go out of fashion? SK: Ultimately, I think the pervasive attitude of heavy metal is one of belonging, of finding your tribe. I don’t think the quest for freedom and a bit of rebellion against the norm are in danger of going away anytime soon. JW: Such as blending genres. Check out Sean talking about his album Where the Wood Meets the Wire, a fusion of classical guitar and metal influences. 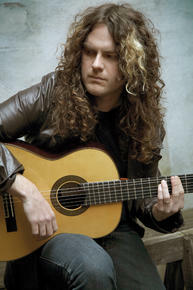 Sean Kelly is the billboard-charting guitarist of his own band, Crash Kelly. He has released several classical guitar albums, and tours as lead guitarist for Grammy Award-winning superstar Nelly Furtado. Kelly has also performed with Helix, Carl Dixon, Gilby Clarke, and Carole Pope, among many others. He lives in Toronto. Visit him at www.crashkelly.ca.